Scrumptious light as a feather lemon cupcakes from scratch. and topped with lemon buttercream. These Lively Cupcakes burst with lemon flavor. They are Perfect for Spring and any time of year! Scrumptious, light as a feather lemon cake, topped with lemon buttercream from scratch! 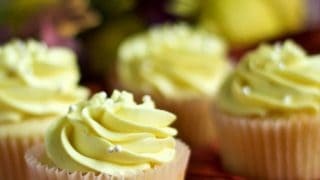 Spring, summer or fall, these delicious Lemony Lemon cupcakes will delight your family and friends. I’ve made this cupcake recipe with this frosting many times over the last several years. It’s SO good. And SO pretty! I’ve decided I’m over winter. It can go away and not show its face until next December as far as I’m concerned. Since I’m in the process of boycotting winter I decided to make these cute and very spring like lemon cupcakes. I settled on making my own spring flowers out of frosting. Both lemon cupcakes recipe from scratch and lemon buttercream frosting recipe are very reliable. Initially I was worried that the buttercream would not hold its shape when making the roses. I’m not worried now. After several years of using this frosting recipe I can say. This lemon buttercream frosting never fails. 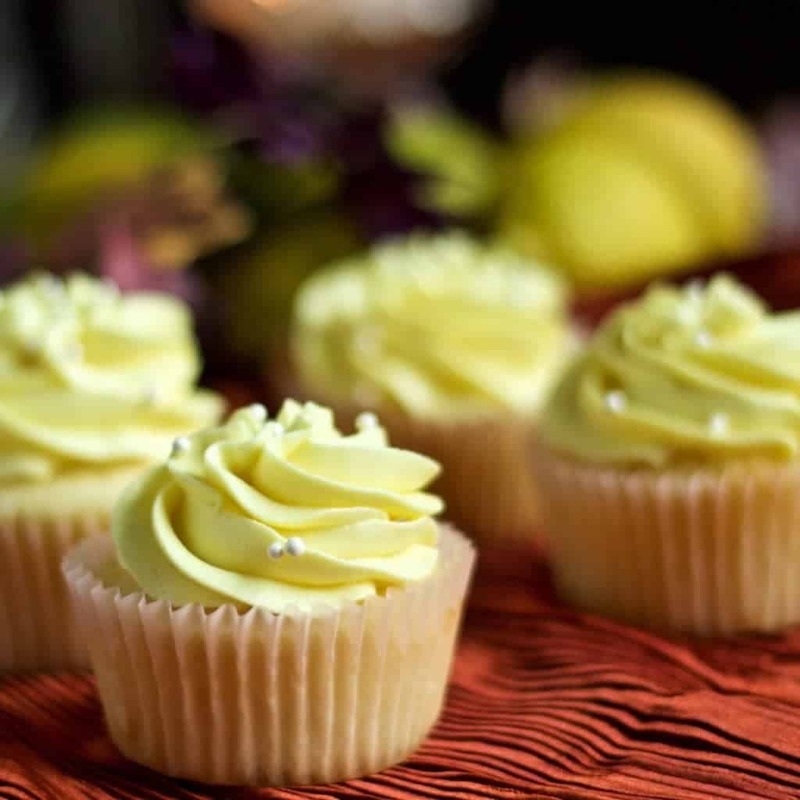 AND The light lemony taste compliments this lemon cupcakes beautifully. 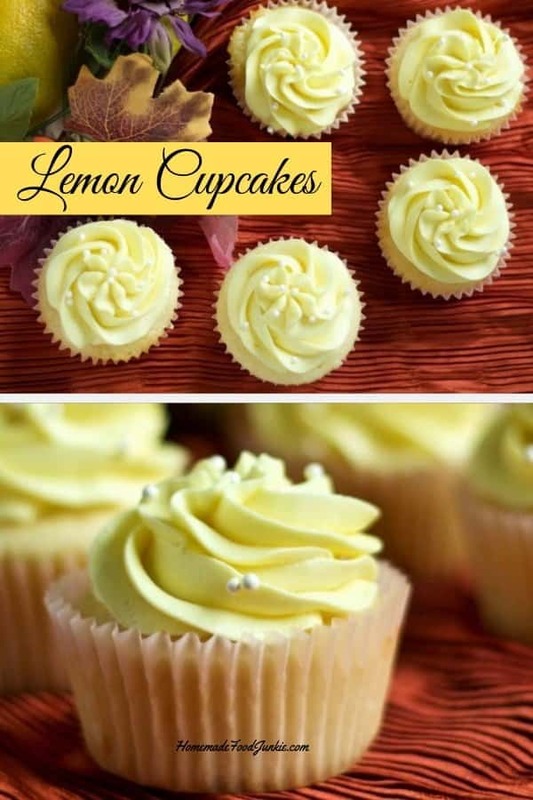 Update on this recipe: I have made this lemon cupcake recipe several times now. Its my favorite treat for Spring. 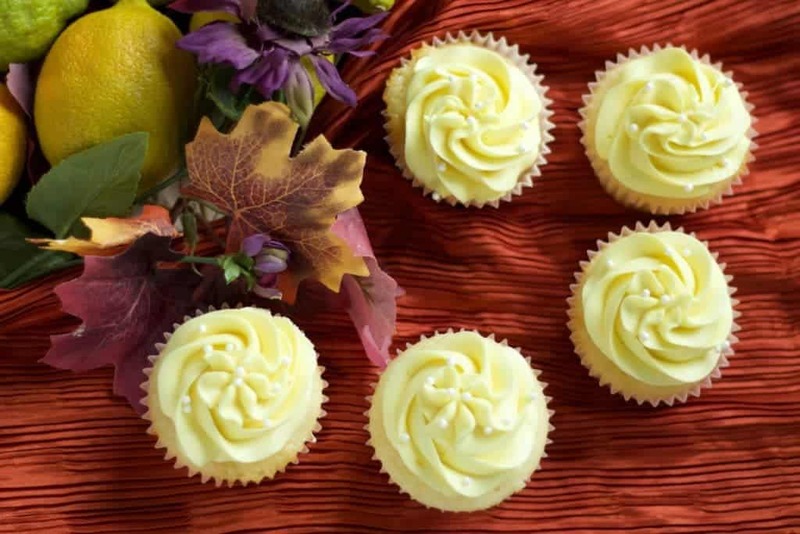 But This lemon cupcake recipe also works for every season. 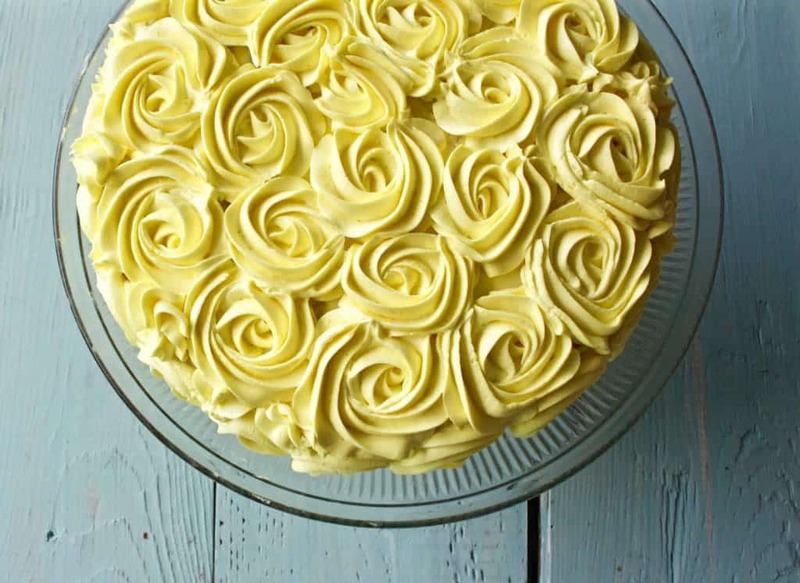 I actually made this Lovely Lemon Rose cake out of this recipe last summer. So pretty! Such a pretty and easy rose pattern! I made this cake last summer. So pretty and SO delicious! I made this last batch of lemon cupcakes to celebrate my niece’s fifth birthday party. 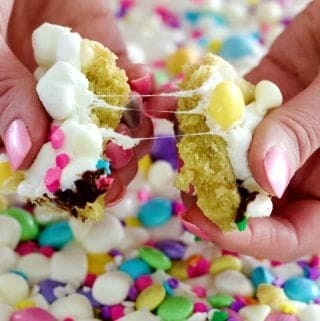 We DEVOURED these incredibly light party treats. Looking for more cupcake and frosting recipes? Head over to CUPCAKE CORNER. I think they look great all dolled up for fall. How about you? Have a party that needs a bright spot of yellow in your fall party tables or maybe want a bit of citrus tang in the mix? 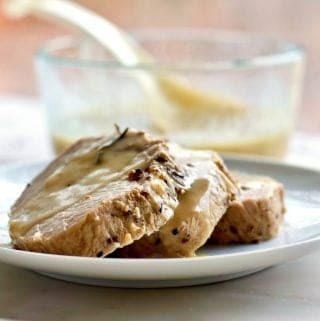 These are great lemon desserts. These would be a fun treat for tailgating or game day too. This is a pretty easy scratch cupcake recipe. 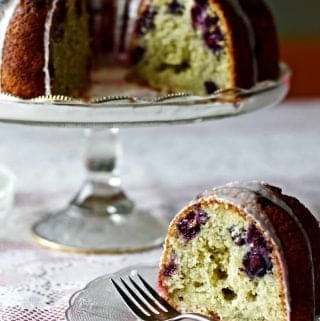 There are quite a few ingredients involved but the process is really very simple. Make sure you have all the ingredients called for before you begin. This lemon cup cake recipe is a good entry level decorator challenge. I was a novice cupcake decorator when I made these. Make sure your frosting is the correct consistency to go through your preferred decorating tip. Feel free to adjust the frosting to suit what you are doing with it if necessary. I made a small part of the frosting recipe green and smoothed it over the cupcakes. I made the remaining frosting yellow for the roses. I used the Wilton Rose Tip to make roses on the cupcake top. Use whatever tip you like. I added edible Easter pearls for a more formal look. Any sprinkles will work on this frosting. But place them BEFORE the frosting is set up right after decorating so they will stay on the frosting better. You can simply swirl yellow frosting with the wilton 2d tip as I did for my nieces party cupcakes. And then place white pearls for a bit of flair. There is a VIDEO in our recipe card to show you a simple decorating idea. And of course you can follow your own inspirations. We’d love to see how you decorate these. Please share with us in the comment section at the bottom of this page how it goes for you. And feel free to reach out and ask questions! Scrumptious, light as a feather lemon cake, topped with lemon buttercream. 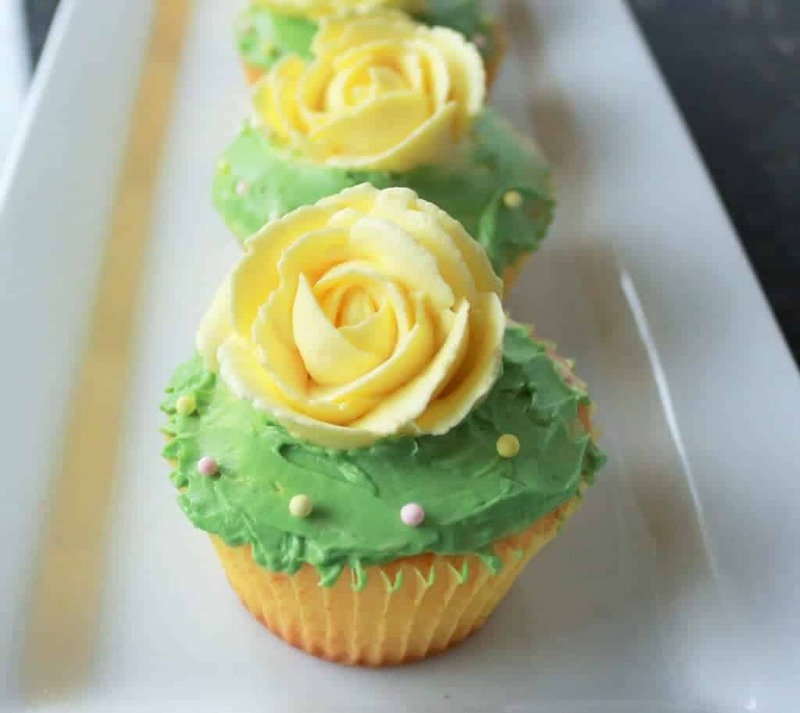 These Lively Lemony Lemon Cupcakes burst with lemon flavor! Perfect any time of year! Reduce the speed to low and beat in 1/3 of the flour mixture, followed by half of the sour cream mixture. Repeat with another 1/3 of the flour mixture and the remaining sour cream mixture. Beat in the remaining flour mixture until just incorporated. 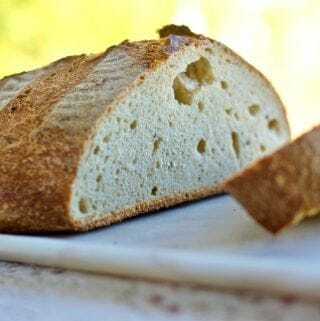 Beat butter for a few minutes until the color is light and the consistency is fluffy. Add powdered sugar and turn your mixer on low, beat until the sugar incorporates with the butter. Add vanilla, heavy cream, lemon zest, juice and coloring paste. Beat on medium speed for another 3 minutes, or until buttercream becomes light and fluffy. These cupcakes are NOT this high in calories unless you use ALL of he frosting. Thanks so much for joining us for #TryABite Tuesday over at Prairie Gal Cookin! Please come join us again for this next week’s link-up! Thank you Prarie Gal. I will! G’day! These are absolutely beautiful Diane and wish I could taste one now! Thank You Joanne! My daughter Kayti made these. 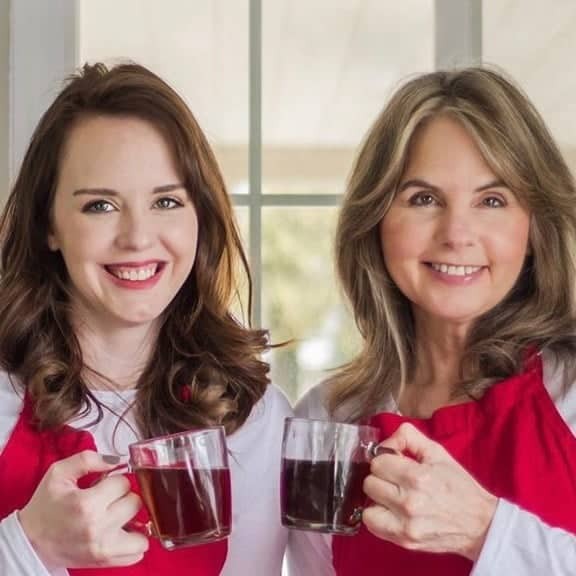 They are amazingly good!